A more recent project at SRI is Robotic Laser Tissue Welding. They are looking at the technology as a means to circumvent the need for suturing. "Telerobotic suturing is especially challenging at longer latencies which would be encountered during robotic combat casualty care. The TATRC funded experiments used a robot to uniformly deliver laser energy to close a laceration. Two methods were demonstrated for direct tissue welding: bovine serum albumin / hyaluronate acid solders and chitosan films. Robot controlled tissue welding of lacerations in explanted pig eyes decreased the total time of tissue apposition from a manual suturing from approximately 8 minutes to 3 minutes. Laser welded tissue had similar burst pressure as manually sutured tissue. These experiments demonstrated that robotic laser tissue welding has potential value and further research is indicated. "Read more about it here. Source: - Broderick et al. 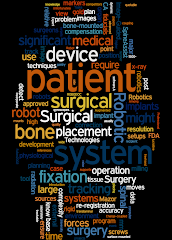 "Distributed Automated Medical Robotics to Improve Medical Field Operations"